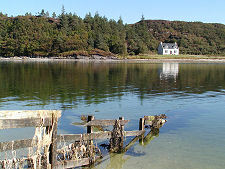 Until 1997, the Road to the Isles, the A830 to Mallaig, passed through the village of Morar. Since then a much better quality road west of the village has effectively by-passed it. This has made Morar a much quieter and very much nicer place. Now you can wander the village and enjoy its atmosphere without having to dodge the fish lorries from Mallaig. 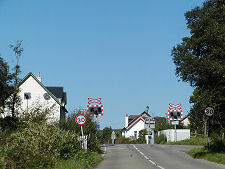 The centre of the village is marked by the Morar Hotel on one side of the road and the railway station on the other. 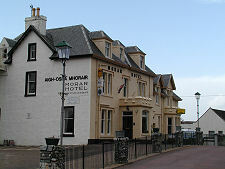 The Morar Hotel is a deceptive place, larger than it initially appears. And it is particularly striking in views across the River Morar from the south, seeming to be standing alone on a wooded hillside the conceals the rest of the village. Not, it must be admitted, that the hotel is usually what you first notice in these views: the stunning beachscapes of the River Morar estuary lie at the northern end of the "Silver Sands of Morar" and your attention is more usually taken by the incredible white beaches and remarkably blue waters found here. 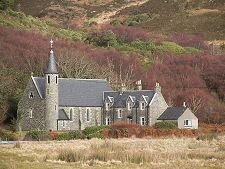 Morar also offers a Thai Restaurant and a Roman Catholic church, plus a large garage at the foot of the hill near the northern junction onto the bypass. Its population is a little over 200. Morar as the village is less well known than Morar as the large and lonely peninsula on which it stands: and it is also less well known than Loch Morar, whose east-west gash nearly splits the peninsula in two. 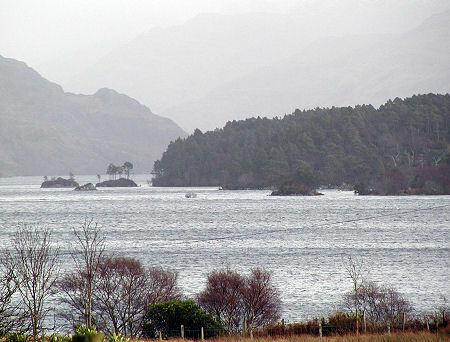 Loch Morar is 12 miles long and over a mile wide in places. 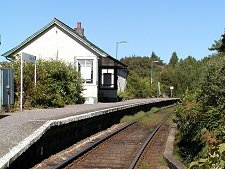 It fails to meet the sea at its western end by a few hundred yards: and the village of Morar occupies part of the strip of land that was left. The River Morar, one of the shortest in the country, carries the outflow of Loch Morar across this strip, though in doing so it falls 40 feet in some spectacular cascades. 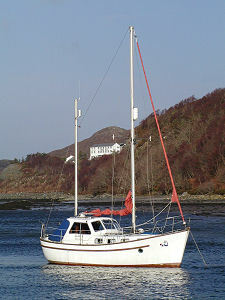 Loch Morar has two main claims to fame. First, although very close to a fairly shallow sea, it is the deepest lake in the UK, reaching a depth of over 1,000 feet. Second it is said to be home to Morag, a monster akin to the more famous Nessie. Morag's sinister reputation is based on the belief that whenever she is sighted it heralds the death of a member of the local branch of the MacDonald clan. Much of the loch, and its east end in particular, is wild, moutainous, and exceptionally lonely. It is much easier to accept the possibility of an undiscovered monster here than in the vastly more travelled Loch Ness. 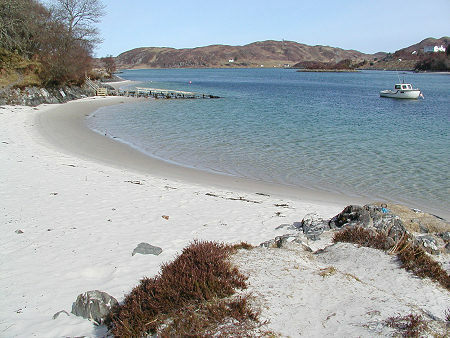 The west end of the Loch at the village of Morar is more popular, with quite a lot of small boating activity, especially in summer.